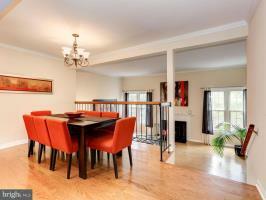 Beautiful spacious end unit townhome w/ sunken living room. Great location, minutes from I-270/370/IIC-200/Metro, Rio and Crown. Home features 3 bedrooms, 3.5 baths, den/office (possible 4th bedroom); new hardwood floors, new carpeting; new paint; granite counter tops, s/s appliances. Finished walkout basement leading to deck w/ bench seating and sink; 2 assigned parking (97 & 98).